News from Golf Tourism Scotland: The "Mach Dunes Million" hole in one contest! Play Machrihanish Dunes Golf Club This Summer and Get a Chance to Swing Away for $1,000,000 USD! 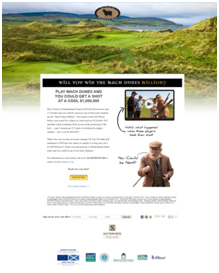 Argyll, Scotland – 16 July, 2013 – The Village at Machrihanish Dunes announced today the kick-off of the “Mach Dunes Million” hole-in-one contest where four lucky participants could win $1,000,000 USD. From 15 July through 15 October 2013, individuals who register and play an 18-hole round at Machrihanish Dunes Golf Club will be entered into a set of random drawings that will determine four finalists to shoot for the “Mach Dunes Million” on 26 October 2013. The contest will take place on the picturesque 14th hole at Machrihanish Dunes, a 167-yard par-3, considered to be one of the best par-3 holes in the UK. Each finalist must be an amateur golfer and will have one (1) shot to attempt an ace. A successful and verified hole-in-one will land the golfer a cool $1,000,000 USD. To qualify for the drawing, players must be 18 years of age, pre-register at the Machrihanish Dunes Golf Shop and complete an 18-hole round at Machrihanish Dunes between 15 July 2013 and 15 October 2013. Finalists will be chosen on four separate dates during this three-month period at random from the qualified and registered pool of entrants. The finalist chosen in each of the four drawings will be announced upon meeting contest requirements and confirming a commitment to return to Machrihanish Dunes for the “Mach Dunes Million” hole-in-one contest on 26 October 2013. For more information and full terms and conditions of the event, please visit www.machdunesmillion.com. A small tournament was held 6 July 2013, where twenty random players at Machrihanish Dunes Golf Club were approached by an “Old Tom Morris” impersonator, who presented them with the immediate opportunity to swing for $1,000,000 USD. Players then teed off in an attempt to ace the 167-yard, par-3, 14th hole. A short video with footage from this impromptu tournament, including “Old Tom” Morris, the hole-in-one attempts, and colourful commentary can be viewed at: www.machdunesmillion.com. For a complete review of the full terms and conditions and prizes for this contest, please visit www.machdunesmillion.com. For information on Machrihanish Dunes Golf Course, accommodation and transportation to Kintyre, please visit www.machdunes.com. To view the four minute video please click here. To view the teaser video please click here.